He said that there is a family from Allen County, Indiana that has recently moved into the Belle Center community. They still drive an open two seater surrey. However, this winter they have placed a kind of enclosed cab over the back seat of the surrey. The parents still ride out in the open on the front seat but the children are enclosed in this cab in the back. Above, you can see what Don was talking about (your captions welcome…and thank you Torey for the photo). The “kid box” is seen only among the Swiss Amish, and only in certain communities (mainly Allen County). 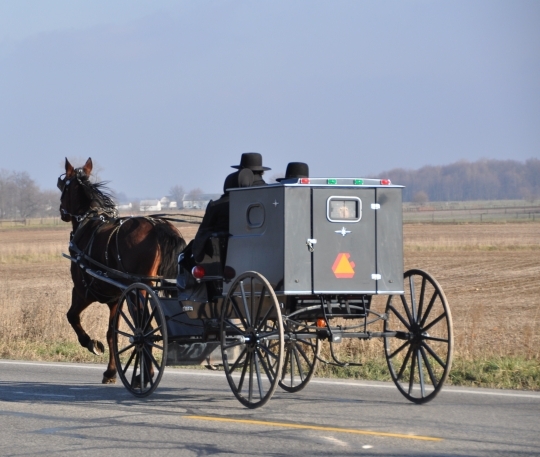 Swiss Amish maintain an open buggy-only tradition, but the kid box is an accepted innovation that gives young children some protection from the elements. Not recommended if you’re claustrophobic. Back to the future 🙂 !!! Is this something that they would need to eventually change in order to conform to the rest of their churchs ordnung? Everett good question, I can’t speak for the Belle Center Amish community, but if you’re asking generally, some churches would require new arrivals to adopt visual elements of Ordnung right away (clothing, buggy) while others may permit use of the old items until new ones are needed. Thanks Erik, I appreciate it. That’s basically what I was thinking. What a neat looking buggy! Even the “kid-box” (is that truly the name? lol) is neat, but so reminds me somehow of a safe for keeping money in that they’d have used on a stagecoach in the old “wild west”. I think that if I was a child, riding in that “box”, no matter how I was brought up, I’d most likely be screaming most of the way (huh, maybe I’d do the same today…). Enclosed, tight spaces such as that and I don’t do well together. But still, it’s very neat seeing how this carriage appears to have been adapted to what the family’s new district allows. I would think it would really help out families changing districts if they were, as mentioned, allowed to use certain items until they wore out, rather than needing to immediately purchase a new one. Buggies aren’t too cheap! And I’m probably wrong, but for some reason, the open carriages of the Swiss Amish (and whoever else uses them exclusively) seem like they’d be even more expensive than the enclosed buggies of other groups. I don’t know what exactly makes me think that. I can’t think of a clever caption like everyone else. All that comes to mind is how much cats (housecats, anyway) love boxes; one day, I could imagine a parent opening the door and finding 10 barn cats who’d managed a way to sneak inside. What a beautiful horse pulling that buggy, too. It looks cold outside, and the horse just seems to be loving it! Sometimes I forget, not having been around horses in a while, just how much better a lot of them like the cool/cold weather than the heat of summer. But maybe, that’s just an old wives’ tale, since horses work in MUCH hotter climates than Ohio, etc. And lastly (is that even a word, or am I just making up words today?) — are those rubber tires on the carriage pictured above? I looked and looked and, just short of getting a magnifying glass, decided that to me, they do look like “regular tires”, rather than the steel-rimmed wheels of many Amish groups. And aah one more question — does the Belle Center settlement permit rubber tires on its members’ buggies? This reminds me of the horse-drawn paddy wagon Benny Hill’s character used in Chitty Chitty Bang Bang. Aren’t the Belle Center Amish a New Order group? Would their Ordnung be more relaxed as a result? Stephanie yes Belle Center is a New Order settlement, it’s hard to generalize as Ordnung would be rather strict on some things (tobacco and alcohol) but may be more flexible on adapting the dress and buggeis in situations when outsiders move in. Frankly I haven’t heard of many Swiss Amish moving to New Order Amish communities. It’s actually 2 significant moves–it is crossing both ethnic boundaries (Swiss–>PA German) which is a cultural change and language difference. You see that happen though, there are a decent handful of Swiss families in the Old Order Lagrange/Elkhart community. In addition it’s also a somewhat different theological approach between traditional Swiss and New Order churches. The first thing I thought of when I saw this “kid box” was how much it looked like something you might use to keep pizza’s hot. I think “The Sound of Silence” would be appropriate for the kid box. The wagon is quite neat in appearance. This box is also big enough to have adults in it. I have pictures of some in it, , and Yes , I know the 2 families who moved to Belle Center. I almost forgot to mention. If you’ve wondered how my soon looks you can catch a glimpse of him online! He went Thursday evening with his distric’s youth to sing at a local nursing home. There was a photographer there from the local paper. He wanted to take photos of them. Mark was the oldest there so the others kind of asked him to talk to the guy. Mark said he told him, “Look, we won’t pose for you. If you take our picture while we’re singing we won’t hold you down and take your camera but we’d prefer you didn’t.” Anyway, the guy snapped a picture and it appeared on the front page of the local paper. You can go to www.examiner.org and do a search for Amish Harmony. Mark is the one obviously not a teenager on the far left. Thanks Don, I enjoyed seeing that. Nice to see Mark again, and really a lovely photo–quite a nice outreach on their part. Thanks so much for sharing that, Don! I’m sure that the residents were delighted to hear their singing. Belle Center sent a good number, too. Don, thanks for sharing that. I would love to hear the group sign. Question; Does the green and pink/purple squares serve a purpose on top of the kid box, or is it something to amuse the kid when outside of the box? Those look like reflectors to me. I’ve never seen those colors on the buggies around Belle Center. The ones around here are usually just red. But, I guess you could have different colors. never seen such a configuration doesn’t carry much weight. It’s quite the crew cab.